What would have you done? Dropped her off or driven back home to tuck her bed? 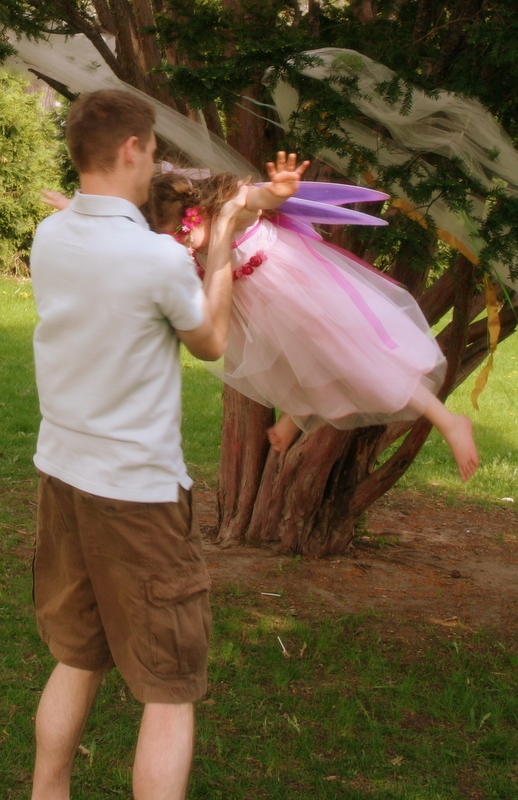 Here is some solid evidence that Ava’s daddy was indeed a part of the fairy festivities. He took the afternoon off a work so he could watch his little lady blow our four candles on a flower cake and run around in pink tulle and glitter wings. He didn’t make it into the little birthday story as the Fairy Good Father and or the Fairy Daddy didn’t have quite have the right ring to it. To be sure, he was quite adamant that he was not be called anything with fairy attached to it. As the absolutely-not-a-winged-creature-from-the-forest, he was responsible for all the amazing photographs (and video–he’s a camera man extraordinaire). He was also responsible for making the fairies fly. “Only if there is a very mighty wind,” I would reply. Last Friday, that mighty wind was her daddy. Hold on tight baby girl, if there was ever a daddy who could help a little girl soar it is this one. 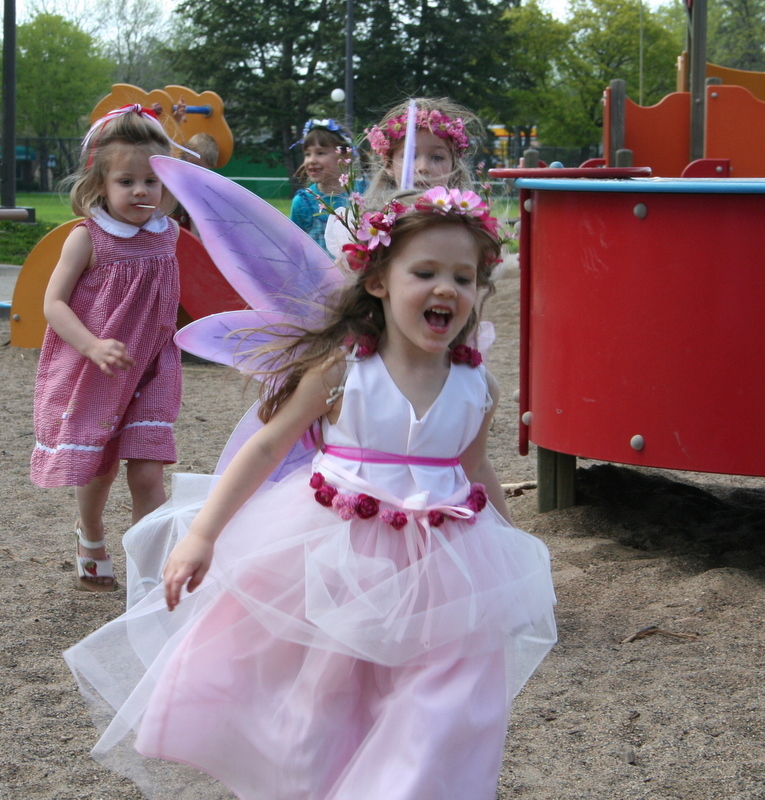 Once upon a time in the merry month of May a little Fairy Princess was born. 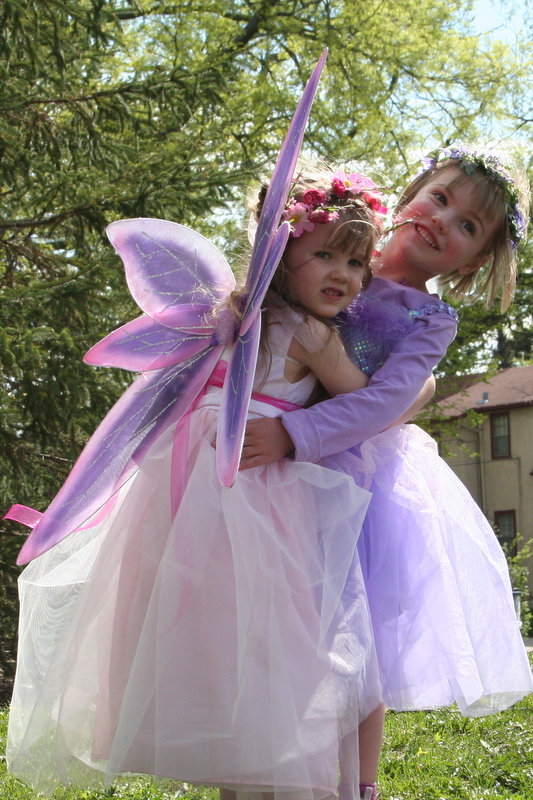 Each year the Fairy Princess grew rosier and happier, bringing delight to all who knew her. 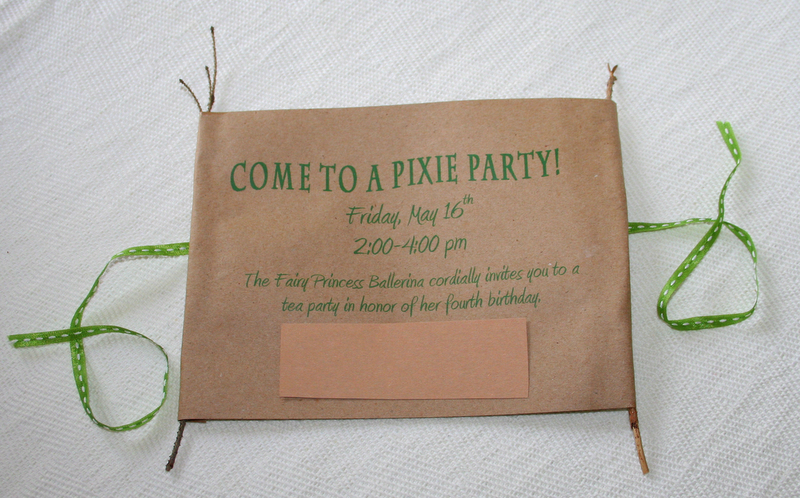 As the fourth month of May came near, she sent out invitations to all her favorite fairy folk. On the day of the party, the sun shone brighter than it had all year. It seemed as though the grass was greener and the birds songs were sweeter too. 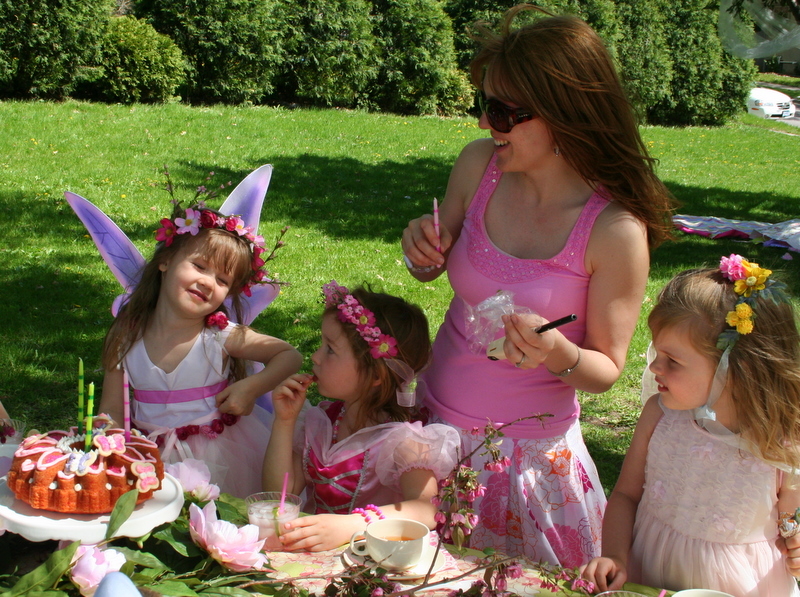 The Fairy Good Mother gathered armfuls of the pinkest flowers and spun them into cloth to spread out for the table. 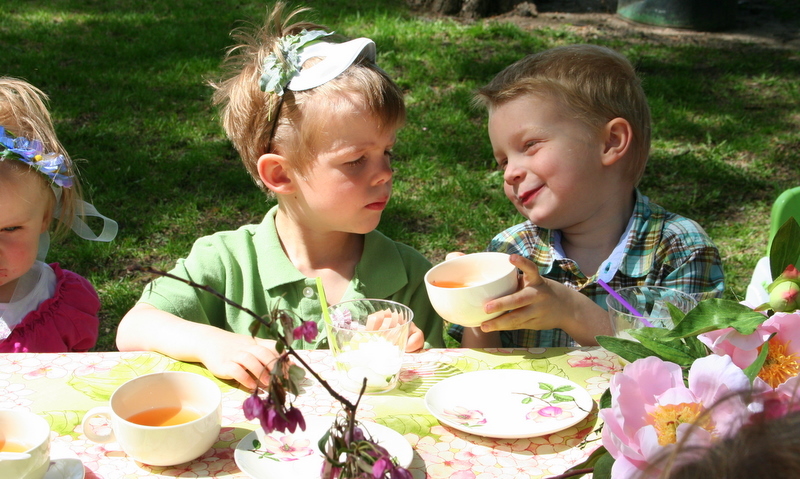 She painted blossoms on the tea cups and melted fuschias into tea plates. Then she sought out the most fragrant cherry blossoms and peonies to lay across the table. In the middle of all the blooms on a white pedestal sat the birthday cake. 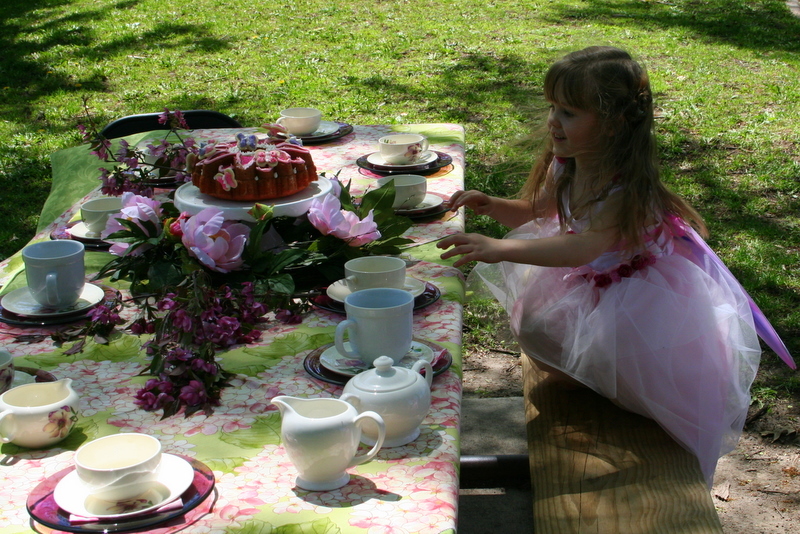 “Is this my butterfly cake?” asked the Fairy Princess as she floated over to the table to wait for the guests. 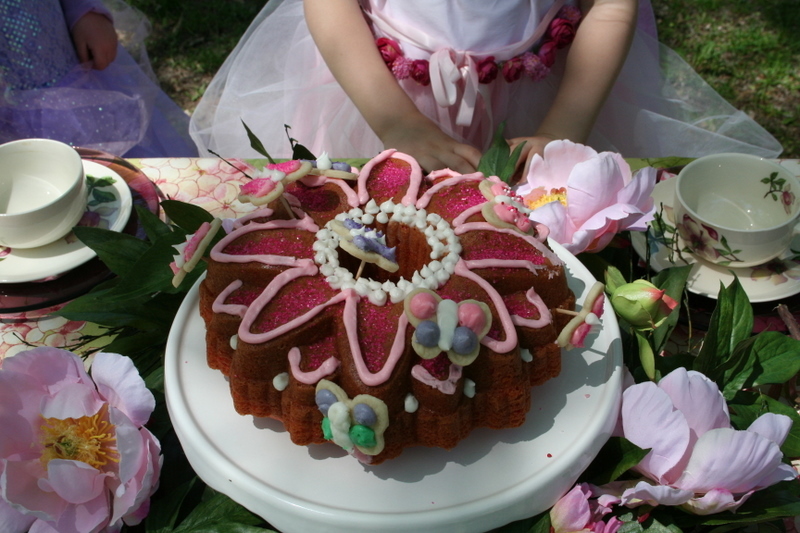 Enchanted by the sweet, glittering blossom, the loveliest butterflies in all of fairyland had landed the Fairy Princess’ cake. 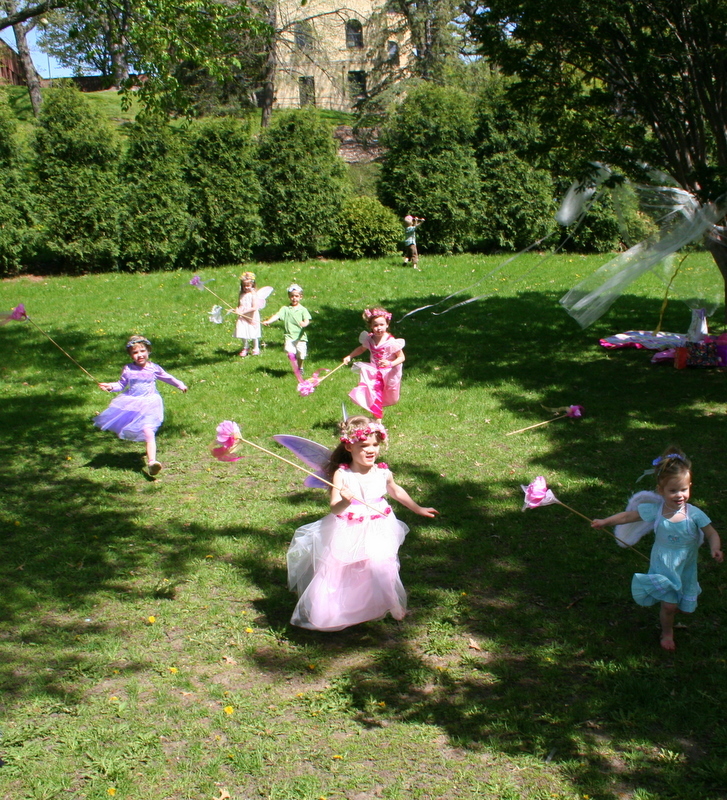 Soon the other fairies arrived, each carrying brightly wrapped surpises for the Fairy Princess. 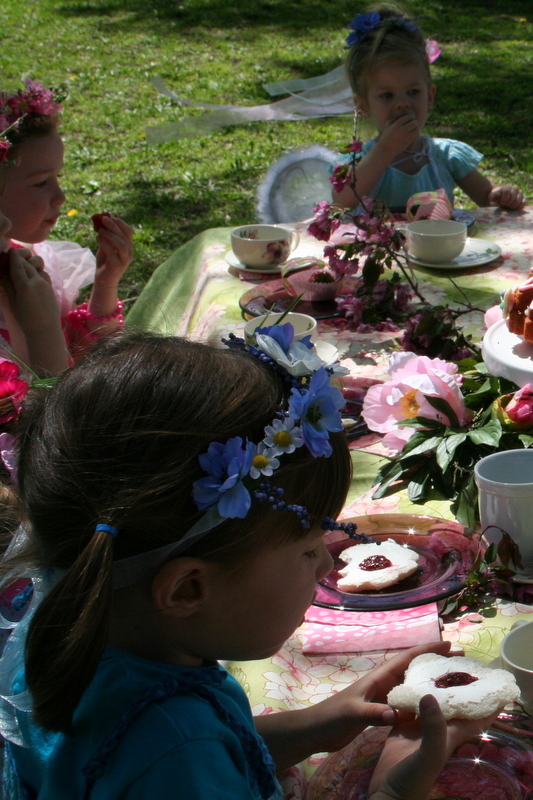 The rosebud, periwinkle, lilac, sweet pea, and poppy fairies gathered to hear about the secret treasure that was hidden away for them. 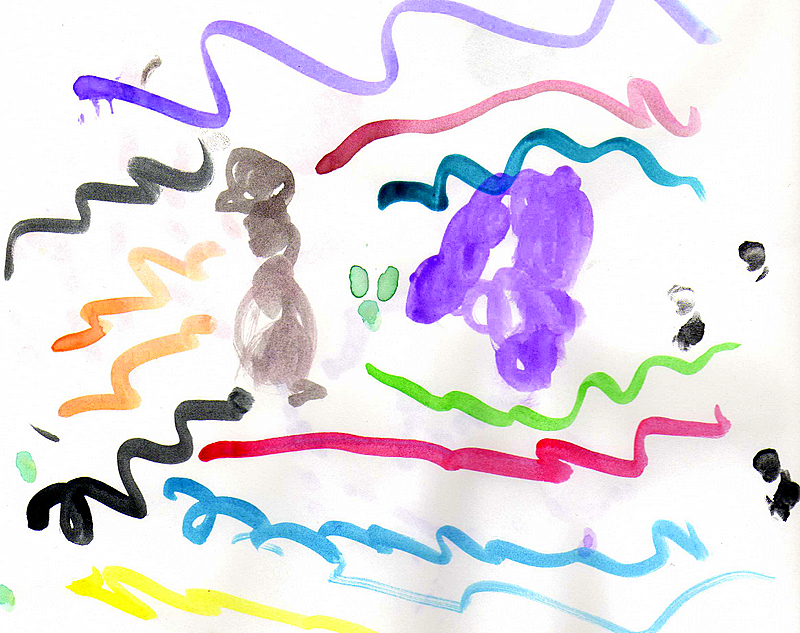 They each took turns leading the others up and down the mossy hill and looking for the secret treasure. Up by the castle, behind the great hedge they found a treasure chest full of birthday wreaths to wear for the celebration. 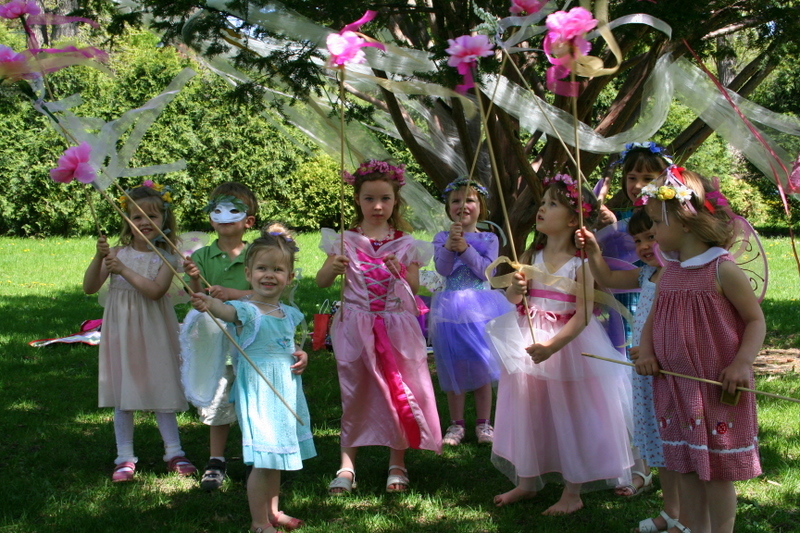 With flowers in their hair and ribbons streaming behind them, they played all sorts of fairy games. 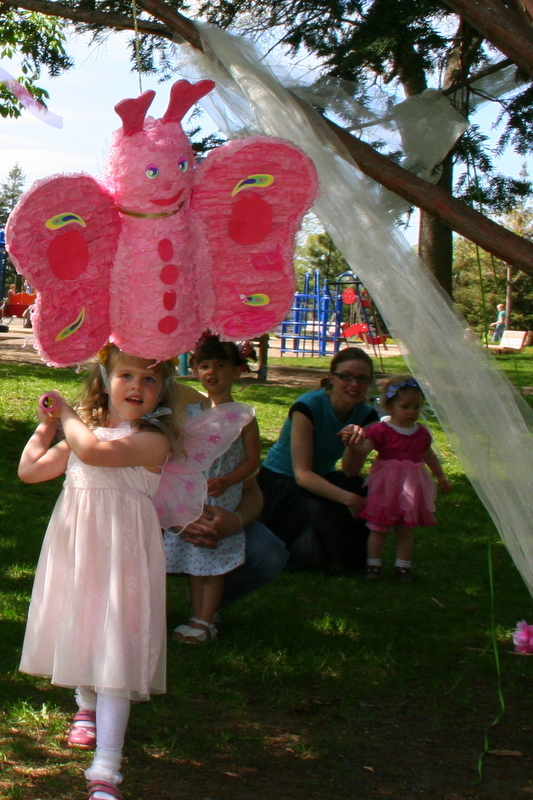 They even found a butterfly pinata full of candy. 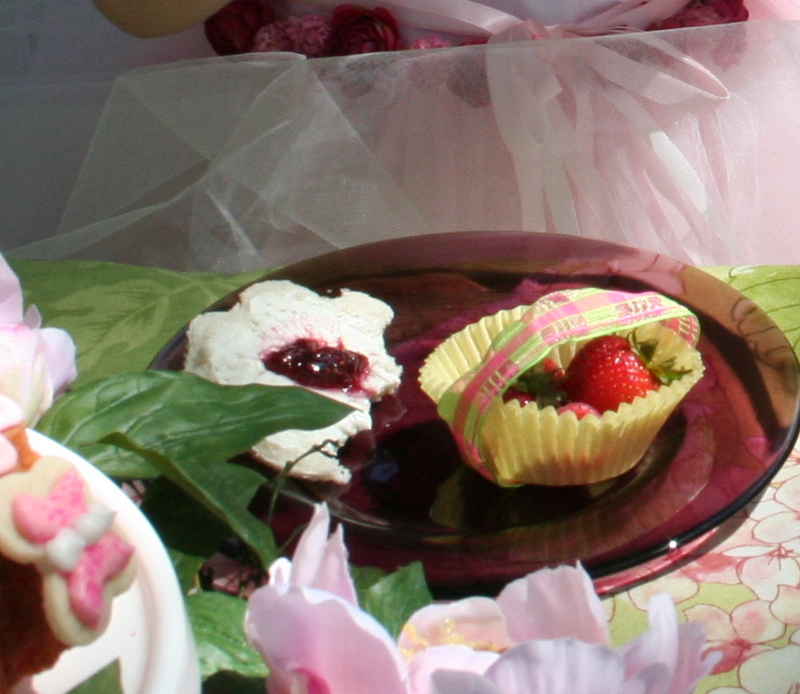 With hands full of sugary treats they floated over to the table to wait for the tea party to begin. and sampled fairy flora sandwiches. They savored sweet baskets of berries. The Fairy Princess nodded and then took a deep breath. With the help of the wind, she blew out all four candles! Now that she was truly four years old, the other fairies agreed that it was time for her to open their gifts. The Fairy Princess happily obliged. Soon the ground the decorated with strips of pink and green paper, and the Fairy Princess was surrounded by all the things a fairy princess would want. 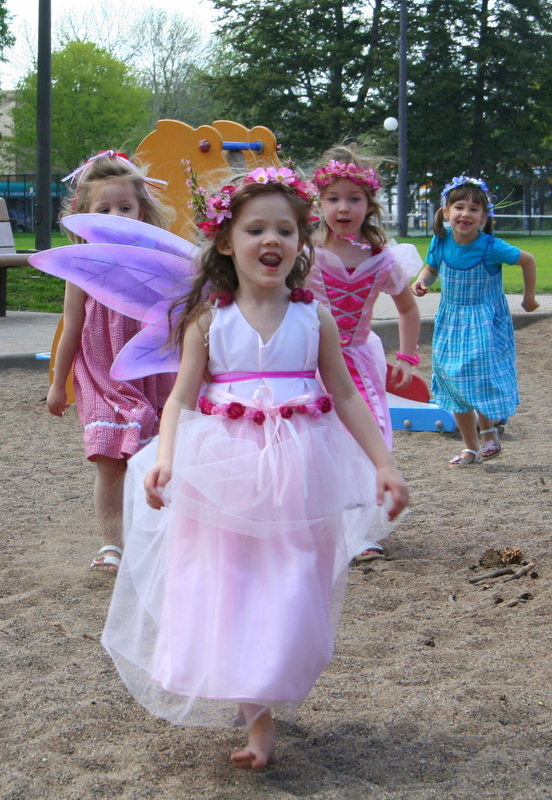 Delighted with their kind gifts, the Fairy Princess gave each of her fairy friends a great big hug. 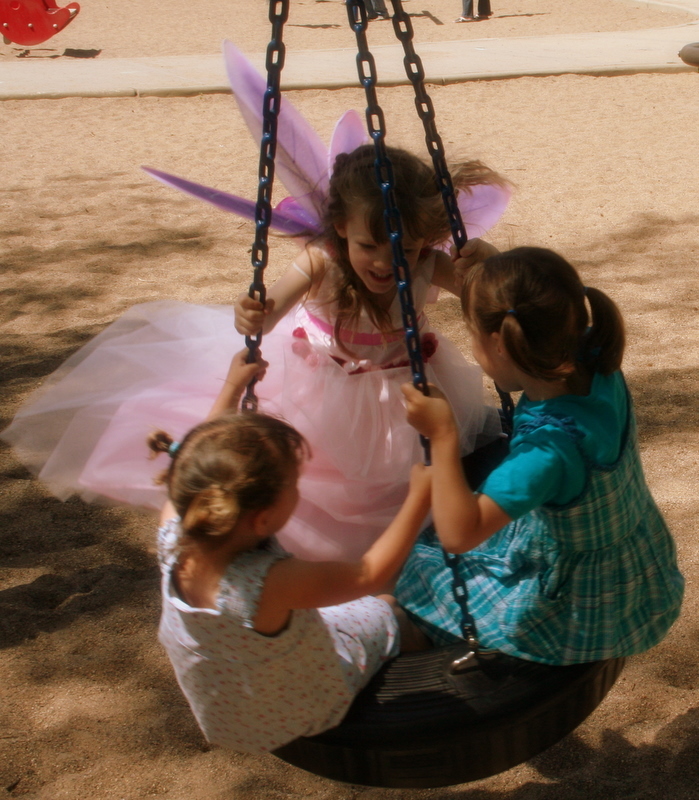 And then all the fairy friends fluttered one more time through the sand before they flew away to their homes. 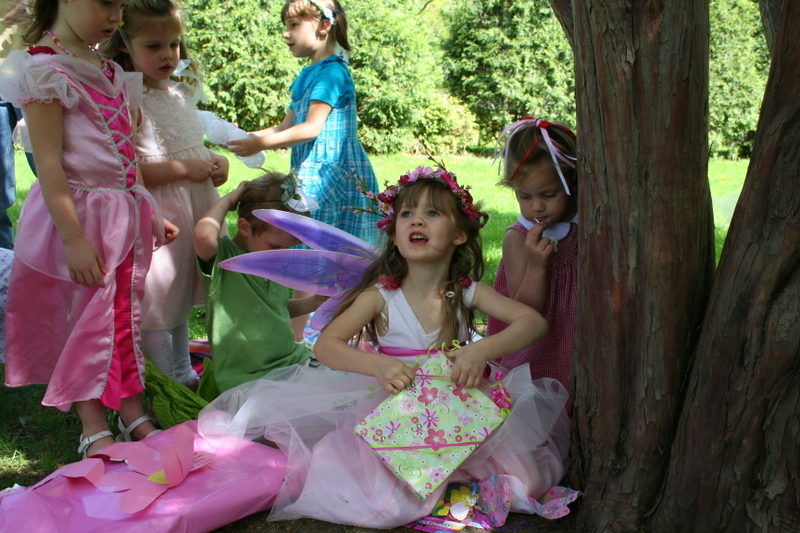 The Fairy Princess’ party was the happiest birthday ever in all of fairyland! who put four candles on my baby’s cake? Ava has exchanged this fairytale for the one in her dreams, and I will soon join her. Before I drift off, I thought I would share one picture. Ava was sure that she wasn’t truly four until she blew out all the candles. Here she is making her passageway out of three. Whatever you are wishing for, my dear one, I hope it comes true. I love you! On Sunday evening, Ava was in her bed for the night and Nate was away at a softball game. The house was quiet and still. A nice, long soak seemed to be the perfect way to end a delightful Mother’s Day. I let the water roar out of the faucet drowning out the sounds of the house and filling the tub with steamy water. I poured in the last of my Lollia bubble bath, a Mother’s Day gift from another year, and watched tub rise with rose-scented bubbles. I was about to slip into my favorite escape when I heard the bathroom door squeak open behind me. My heart raced into my throat and I let out a scream as I turned to meet my foe. 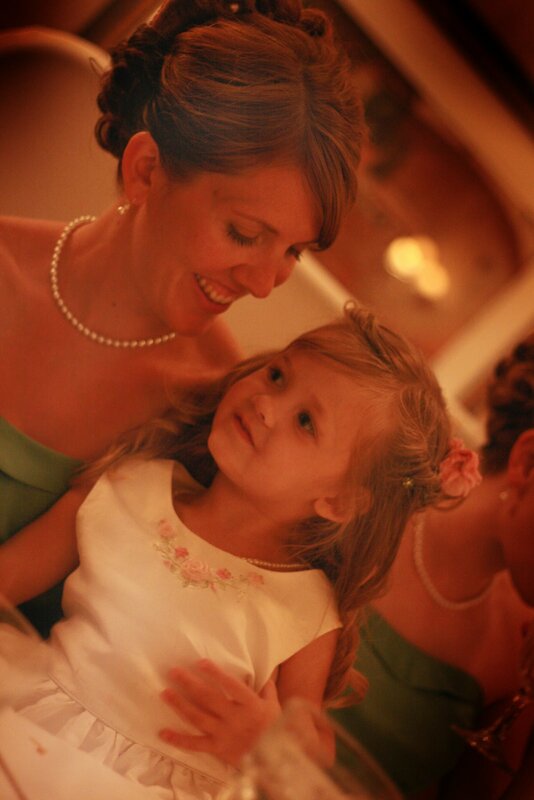 “Mama, when we were in Heaven we just liked each other so much that we just always wanted to be with each other. And so we thought that you should be the mama and I would be the little girl. And then you had to go and then I had to wait for a long time, didn’t I? A really long time! And then God said it was time for me to go into your tummy. And you, Ava are the one I always wanted. Thanks for making this a most happy Mother’s day. 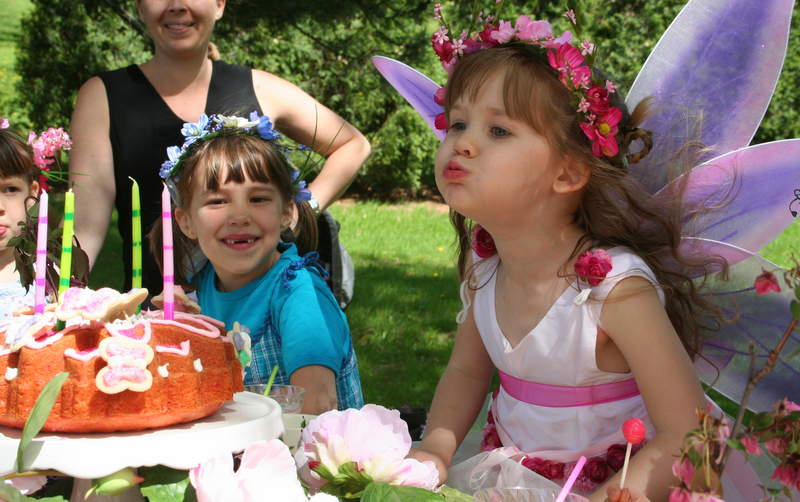 At some point after her third birthday and before her fourth birthday, Ava realized that birthday parties are something that happen every single year. 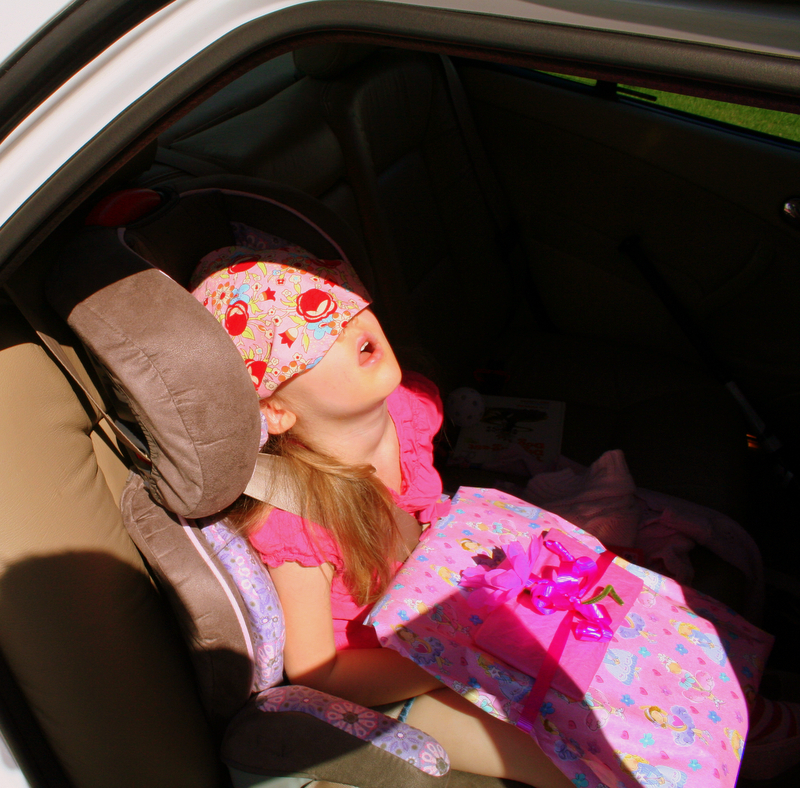 And she has been looking forward to her fourth birthday ever since. As the calendar pages have turned closer to May, her dreams about her fairy princess birthday party have grown increasingly vivid. She has been telling and retelling me who she wants at her birthday for weeks. I finally sat down with her a couple a weeks ago to get the official list. It had thirty-two guests on it. Clearly, I’m not going to invite thirty-one children to my house, especially children that I would need a private eye to find. Then last week, she announced that only girls can be fairies. So only girls could come to her party. Between trimming out nameless children and sweet boys who probably don’t want to wear fairy wings, we reduced the list to a manageable number. 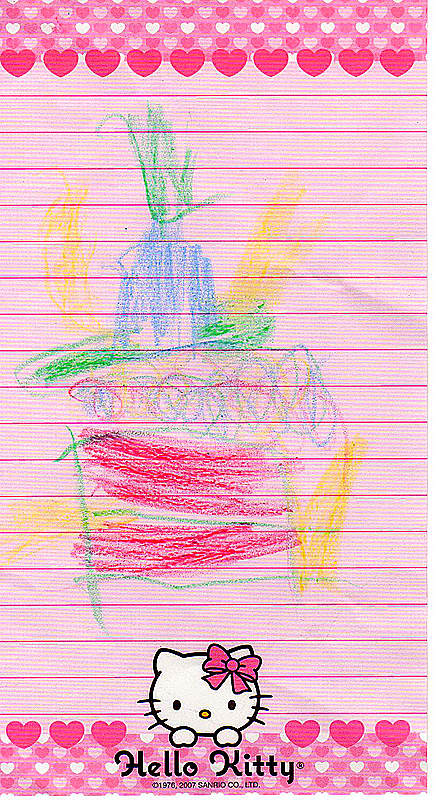 Yesterday, Ava drew a picture of her birthday cake. Anyone know a talented confectionist, who is also an expert in pyrotechnics? Today, she created an invation to her birthday party. You like how she weaved that unrelated nugget of wisdom into her invitation. It’s genetic. Also genetic: the propensity to love one’s birthday. It would be a lie to deny that I haven’t been thinking about her party as much or more than her. 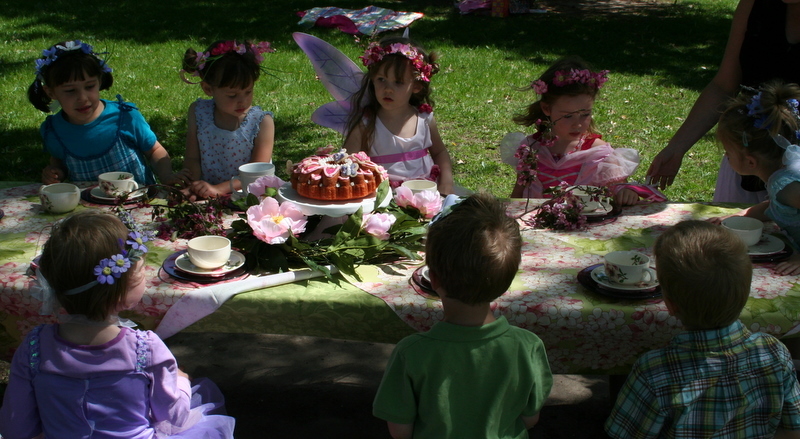 I saw this magazine article about a pixie party in the forrest three years ago, and have been wanting to throw her a fairy party ever since. Last night, I showed Nate the near sacred picture and his words were: “You have got to be kidding me.” I don’t know if it was the two white horses or the flurry of tulle that exacted such a response. Either way it is clear that this party will never live up the fantasy Ava and I have concocted in our minds. Like her mother, her nuggets of wisdom (or clarity) are reserved for the written swirl.